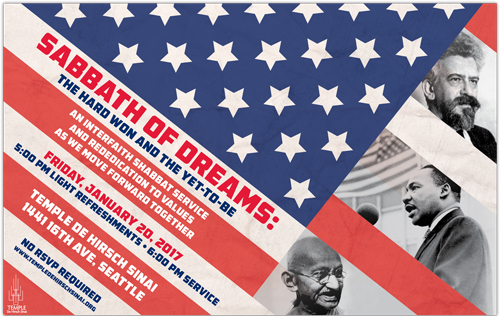 You are invited to an Interfaith Shabbat Service and Rededication to values as we move forward together, “Sabbath of Dreams: the Hard Won and the Yet-to-be.” 5 p.m. light refreshments; 6 p.m. service. An accessible Jewish Sabbath service with some insights from The Rev. Dr. Martin Luther King, Jr.; Rabbi Abraham Joshua Heschel; and Gandhi. An evening offering inspiration, direction and purpose for the future in ways that are unique to faith communities and traditions.